Honourable Indian Prime Minister Narendra Modi backed India to develop as a footballing nation with the upcoming FIFA U-17 World Cup 2017 acting as a catalyst for the longer run. In a statement released earlier today, Prime Minister Modi spoke about how the competition can spark a monumental change in India. “India is going to host the FIFA U-17 World Cup in 2017, but successful hosting of the event alone cannot be our final objective. FIFA U-17 World Cup India 2017 must be a catalyst for change, the tipping point for football in the country, which can only be done by creating a mass movement around it. The objective is to give an opportunity to every child in the country to play football”. A legacy programme of the FIFA U-17 World Cup, “Mission XI Million” is a school contact initiative, which leading up to the highly anticipated tournament in October, will evolve into India's biggest outreach sporting activity ever, and leave a lasting legacy for the first FIFA tournament in India. Prime Minister Modi had spoken about the outreach programme in his Mann Ki Baat on 27th March 2016, and calling it a “mass movement”, once again talked about it to give further support to the pioneer programme. “Mission XI Million will take the beautiful game of football to at least 11 million boys and girls around the country. Children in every state, from Kashmir to Kanyakumari, from Kutch to Kanyakumari will get a chance to learn, play and enjoy football. More than 15000 schools around the country will be partners in this,” he expressed. Calling every parent and teacher to encourage children, PM Modi added, “We need the support not just of children but also of every parent and every teacher to encourage boys and girls to play football and develop both skill and fitness. I am confident that these children will be able to take Indian football to its rightful place in the world”. Tournament Director for the FIFA U-17 World Cup India 2017, Mr Javier Ceppi, was delighted with the show of support from the highest office of the country and added, “We have been working very hard on making this a success. 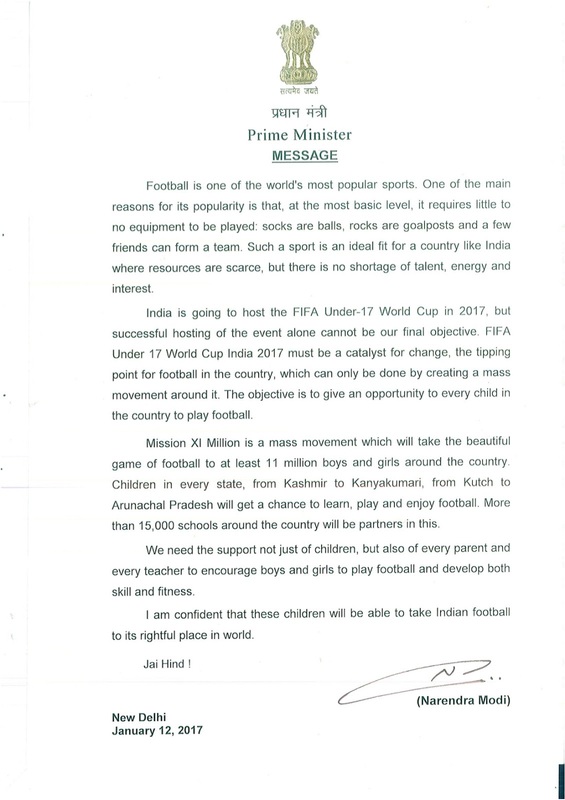 This backing from Prime Minster Modi will only strengthen our resolve to make this the most popular and watched World Cup in India and help change Indian football".